Last year I was ruminating about pubs named after butterflies. Now I have discovered a moth beer. I was working in the Lake District last week and stopped off at the Swan Inn in Newby Bridge where they serve Barngates beers. These are brewed by the owners of the Drunken Duck Inn near Ambleside and they have a tradition of naming their beers after the pub's pets )check out www.barngatesbrewery.co.uk and www.drunkenduckinn.co.uk). 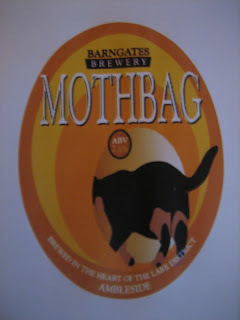 Hence this one, Mothbag, I thought the animal on the pump clip was a cow, although I hadn't had even a sip at that stage, so Lucy from the brewery was a bit puzzled when I emailed to ask why. She put me right. I must have been dozy from overwork. As you can see, Mothbag was a cat, who lived at the Duck and acquired her name because she was 'a bit scraggy but well-loved.' So says Lucy. A mothbag also seems to be an American device for preserving clothes on the lines of our mothballs. Foreigners always put everything in bags, eg tea, which is much better when you can crunch the leaves. Anyway Mothbag, the beer, is very pleasant, light and slightly citrus for a summer's day, if we ever get one of those again. It's been pouring here, and windy.